Warm wishes to all of you on a cold winters day. It was fun to work with sunny yellow. I am taking your class right now and loving it. The journal pages you have posted on your blog have been very inspirational. This yellow one is one of my favorites. Thanks for sharing your talents with us. wow–i dont’ know how you keep up with all of these pages!! I think the sunny yellow is my favorite so far, but then again, everyone I see is a fav :)I finally got the Art Journals magazine and LOVE LOVE LOVE your awesome feature! Cool shout out to Metsy as well! Gorgeous! I love looking at the detail of your pages, there is just so much to see! This is just what I needed after all this snow! Oh, I love your pages!! I’m doing Misty’s prompts too. I’m a bit stuck on pink. I probably should get started on it, huh? 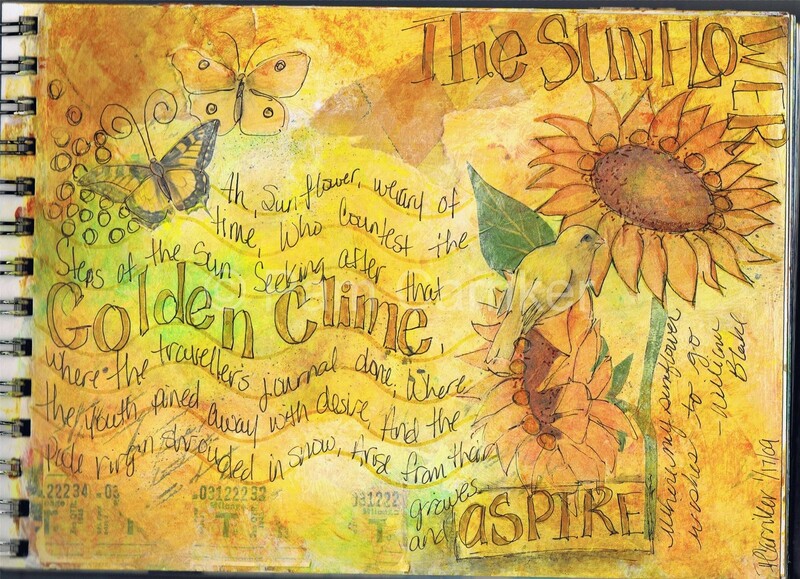 Hi Pam…..This is such a pretty page…yellow is my hardest color to work with but I may give it a try after seeing this sunny delight! Enjoying the class so much!